COMPANY PROFILE Commerzbank AG provides banking and financial services to private and corporate clients, and institutional investors. Its segments include Private Customers, Mittelstandsbank, Central and Eastern Europe, Corporates and Markets, and Non-Core Assets. Founded in Hamburg in 1870, Commerzbank is the second- largest private bank in Germany. The bank has around 1,000 branches and 50,000 employees and operates in more than 50 countries, with Germany and Poland its core markets. Under its 4.0 strategy, its customer business will be focused around two segments: private and small-business customers, and corporate clients. The Mittelstandsbank and corporates and markets segments will be merged and sales and trading activities in investment banking scaled back. 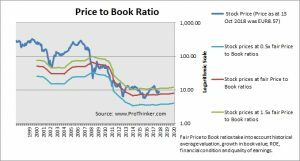 At the price of EUR8.57 as at 13 Oct 2018, Commerzbank Ag is trading at a Price to Book Ratio of 0.4 times current book value. 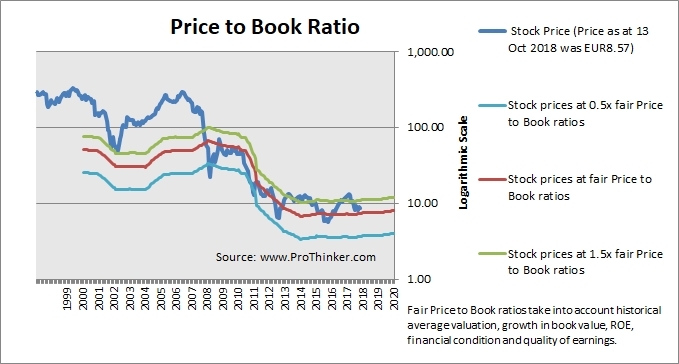 This is a 16.0% premium to current fair Price to Book Ratio of 0.3 times.